Our eCommerce software offers integration with Google Analytics, which is a free program from Google that tracks and reports website traffic. To use Google Analytics, sign up and create your free Google Analytics account. 1. Log into your eCommerce dashboard. 2. Go to Operations > Settings > Google. 3. In the field, enter the UA Number. You do not need to enter the entire HTML snippet from Google, only the UA account number associated with your site in Analytics. No HTML code should be placed in this field or anywhere on your website. 4. Check the Enable Google Analytics box. Note: Your statistics may take up to three days to populate within your Analytics account. You have now added to the Google Analtyics tracking code to your eCommerce products. You can also track conversions for your store, which report the percentage of visitors to your website that completed a transaction. The average transaction amount per checkout and average transaction amount per visit are also recorded. Note: You can combine Google Analytics with Google AdWords campaigns to review the advanced details, such as the advertising cost to sales ratios. 1. In your Google Analytics account, go to Admin > Ecommerce Settings. Check the Enable Ecommerce option. 2. Go to Operations > Settings > General. 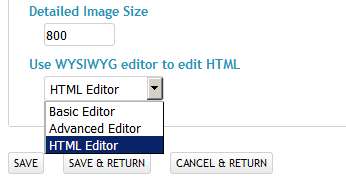 Click the Use WYSIWYG editor to edit HTML drop-down arrow, and select HTML Editor. Click Save. 3. Go to Operations > Payments. 4. In the Action column, click EDIT to update any of your payment methods that are in ENABLED status. You are taken to a new page, which has the Confirmation Message section. 'id': '<%Order.Number%>', // Order ID. Required. 'revenue': '<%Order.Total%>', // Grand Total. You have now enabled conversion tracking using Google Analytics.